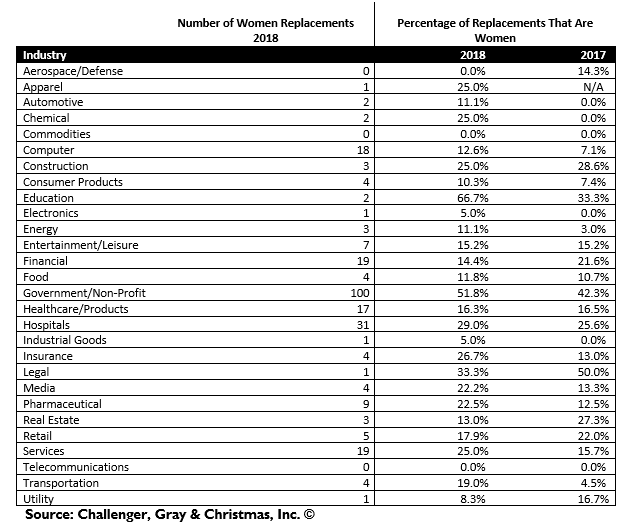 2018 Women CEO Report: 22 Percent of Replacement CEOs Are Women, Up From 18 Percent in 2017 | Challenger, Gray & Christmas, Inc.
Over a year after the #MeToo movement exposed several executives with allegations of sexual misconduct, causing their removal from the CEO role, including Harvey Weinstein, Les Moonves, and Steve Wynn, the rate of women taking over the role of Chief Executive Officer in 2018 rose to 22 percent, after hovering at 18 percent in both 2017 and 2016, according to a report released by global outplacement consultancy Challenger, Gray & Christmas, Inc.
Of the 1,183 replacement CEOs recorded in 2018, 264, or 22.3 percent, were women. That is up from 18.4 percent in 2017, when women represented 183 of 993 replacement CEOs announced by U.S.-based companies. Challenger tracks CEO changes from U.S.-based companies nationwide that have been in business for at least two years with a minimum of ten employees. “The rate of women CEO replacements has risen steadily since 2014. It’s the highest rate of women CEO replacements since we began tracking gender data in 2013. As companies grapple with increased awareness surrounding gender equality issues, such as pay parity and eliminating sexual harassment and gender discrimination, they appear to be hiring and promoting women candidates into the top role,” said Andrew Challenger, Vice President of Challenger, Gray & Christmas, Inc.
“This is crucial to creating an environment where bullying and harassment based on gender is eliminated,” he added. For example, this month, CBS hired Susan Zirinsky, its first female president, to oversee its news division after Moonves’s high-profile exit. According to an October 2018 New York Times piece, of 201 men who were ousted after allegations of sexual misconduct, 54 of 124 replacements were women. Men still represent the vast majority of CEO replacements, accounting for 78 percent of the replacements recorded in 2018. In 114 of those instances, men were named as replacements for women. Last year saw 175 women replace male Chief Executive Officers. Last year, eight CEOs left due to sexual misconduct allegations. Of the six replacement CEOs named, two are women. In 2017, 12 CEOs left due to sexual misconduct allegations, including Harvey Weinstein. Eight companies announced replacements for those leaders, four of whom were women, according to Challenger tracking. The Government/Non-Profit sector named the most women CEOs in 2018 with 100, 51 percent of all incoming CEOs in that industry. Hospitals named 31 women CEO replacements, 29 percent of all replacement CEOs named at hospitals in 2018. Both the Financial and Services sectors appointed 19 women CEOs, 14.4 percent and 25 percent of all CEO replacements in those sectors, respectively. Computer companies, which include software developers and hardware manufacturers, appointed 18 women CEO replacements, or 12.6 percent of all replacements. Despite these positive numbers for women leaders, the number of women CEOs from Fortune 500 companies fell 25 percent in 2018. Under 5 percent of Fortune 500 companies are now led by a woman. High-profile exits include Indra Nooyi from PepsiCo and Denise Morrison from Campbell Soup. According to Challenger tracking, 259 publicly traded companies announced CEO exits last year. Of the 217 of those that announced replacements, 18 were women.